My Year Nines bundled into my classroom this morning with even more excitement than normal. I attributed this extra energy to a combination of the high winds as the remnants of Hurricane Gonzalo battered our sceptered isle and the imminent prospect of the half term holiday. One of the students had discovered “the end of maths.” One of the students had discovered Photomath. 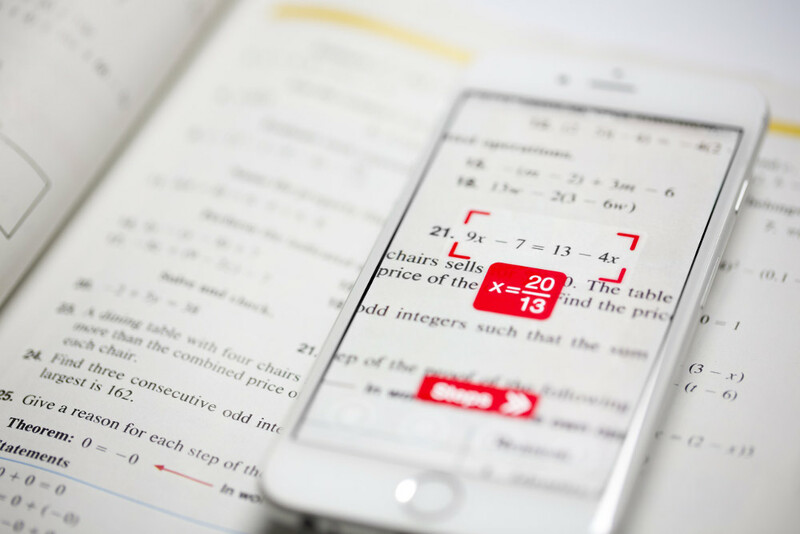 With great fanfare and pride, he whipped out his iPhone and declared that his new app could solve maths questions. It seems it can’t (for now at least) solve quadratics. But its still a pretty neat bit of kit. And does it spell the end of maths as we know it? Probably not. I’m of an age such that I was amongst the last to take my ‘O’-Levels without being able to use a calculator in any papers. All the advent of the calculator did was free students from the shackles of mechanical computations (and log tables) allowing them to spend more time tackling harder problems. So as I pointed out to my pupils, much to their disappointment, this wonderful app probably just means that their maths will get harder. Which is a good thing, although I’m not sure that they all agreed with me on that. Will I allow my pupils to use the app? Absolutely. As a means for them to check their work it’s unrivaled. Students are far more engaged when they are in control of their learning and this app gives them instant feedback. And I’ve learnt over the last few years that they are far more likely to “listen” to an electronic device, rather than teacher, telling them that they are right or wrong. Also, the step by step solution to a problem given by the app is great at guiding a student through all the stages of answering a question: the app does what too many students don’t do – it shows it’s working out. Oh, and the app does occasionally get things wrong. For example, when a question number is close to the question itself, if you are not careful in lining up the camera you can easily include the question number as part of the question. I’m sure the developers will be keen to rectify any bugs but, as a teacher, I’d be quite happy for them to leave them in. When a pupil gets a different answer from the app it leads to some great discussion points and debate as to who is right, them or the computer, and it really forces the pupil to think about the maths behind their answer. So, much to the chagrin of my Years 9s, its not all over for maths, but they have now got a great new tool for exploring the subject. This entry was posted in Algebra, Numeracy, Teaching Tips. Bookmark the permalink. Post a comment or leave a trackback: Trackback URL. Absolutely we should embrace Technology as a Teaching Tool, just gets frustrating sometimes when some of the more expensive tools are out of our reach and yet they are needed now to inspire these kids! A good point David. Its something that we, as a society, need to think about: what is the expectation of access to technology for today’s students? I’d definitely say that access to the internet (outside of school) is now essential for all pupils, its an integral part of the world in which they live in and the world in which they will work in in the future. Some of the more expensive devices (tablets etc.) are not necessities but will, whether its fair or not, confer an advantage on those that have access to them – as long as they use them productively. I suppose an analogy would be that, when we were growing up, living in a house filled with books, or at least a decent encyclopedia, was a definite advantage – but again, only if they were used effectively. iPads, computers, “the web” are simply tools – albeit very powerful ones – it is how they are used that is important. An interesting comment – thank you.